Despite accelerating weakness in NASCAR attendance and ratings, ISCA shares have held up. The catalyst of late has been a non-binding acquisition offer of $42 per share from NASCAR itself. ISCA trades at a premium to the offer, which seems to suggest investors are expecting a higher bid. That's certainly possible - but if a deal doesn't get done, ISCA has good ways to fall. International Speedway (ISCA) truly has been confounding. My bear case for years now has been reasonably simple: declines in NASCAR fan interest would lead to lower attendance, offsetting annual increases in ISC's share of the sport's lucrative broadcast contract and keeping near-term earnings reasonably flat. From a longer-term perspective, steadily shrinking TV ratings - another symptom of the fan malaise - in turn, suggested an increasing likelihood of a step down in media rights revenue in 2026, when the current contract expires. ~Stable free cash flow for seven years followed by a notable downturn seemed to imply a single-digit free cash flow multiple at best - while long-running capital allocation concerns suggested an even greater discount. The bearish outlook has played out almost to a tee. The midpoint of FY19 (ending November) EBITDA guidance of $230-$250 million is pretty much flat to FY16 levels ($238.8 million). That's despite what should be a double-digit percentage tailwind from media rights increases over that period, plus another ~$15 million boost (as estimated at the time) from $400 million in capital used to renovate ISC's flagship track in Daytona. 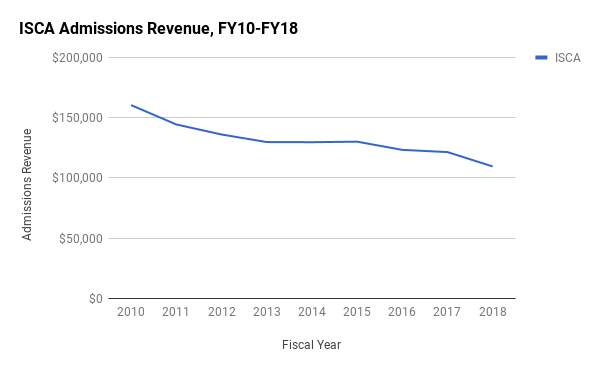 Admissions revenue declines have not only continued but accelerated, with a nearly 10% drop in FY18 the worst performance since fiscal 2011 (when a still-weak economy colored consumer decisions to spend not only on race tickets but hotel room and other required expenses). TV ratings have plunged: the average audience for 33 Cup Series races fell 27% in two years, including a nearly 20% drop in 2018. That said, there's been a near-term catalyst. In early November, NASCAR itself made a non-binding offer to buy out International Speedway at $42 per share. The news led to a quick reversal of a post-earnings sell-off following a dismal third quarter report. And at the moment, investors appear to be pricing in at least a possibility of a raised bid. Admittedly, that makes some sense. Both NASCAR and ISCA are controlled by the France family. It would seem likely that if the independent directors on the ISCA special committee ask for a few dollars per share more, NASCAR would oblige. At the same time, however, the risk/reward here hardly seems favorable. Even a 10% premium from the original bid suggests limited upside when considering the time needed to close the deal. And the downside risk seems substantial if the deal falls through for whatever reason. This feels like a stock priced for a merger arbitrage play - without an agreed-upon deal in place. With results continuing to disappoint, the downside hardly seems to justify the limited upside - but, of course, I've been making that argument unsuccessfully for years now. The first quarter is quiet - but even still the report only added to the concerns. On the Q4 call, Saunders closed by noting the company was "trending toward a sellout for the DAYTONA 500", which is the only Monster Energy Series race in Q1. That changed, on the Q1 call, to "the fourth consecutive sell-out of reserved grandstands". Admissions revenue in the quarter fell 4%. In other words, in the third year after spending $400 million to overhaul the track - and removing thousands of seats in the process - the sport's flagship race, at its flagship track, still is seeing declining attendance and revenue. Looking forward, the news is similarly disappointing: Q2 admissions revenues are headed toward a ~5% decline, per commentary on the Q1 call. ISCA management has attributed the weakness to attendance problems for sporting events more generally - but that explanation doesn't hold up. Major League Baseball attendance was down 4% last year - but the NBA is at record levels in terms of sales and percentage of capacity. Combined with the declining TV ratings - which aren't, as management argues, offset by higher digital consumption - the NASCAR fan malaise is clear. As it turns out, losing the sport's most popular driver (Dale Earnhardt) and possibly #2 and #3 (Tony Stewart and Jeff Gordon) is a huge problem. Of course, the negative trend predates those retirements. And ISCA management really doesn't have an answer. On the Q4 call, CFO Greg Motto cited the use of "big data" in the sales process as driving success - but revenues, as noted, are plunging anyway. Saunders talked up eSports on that call, and in the Q&A called the trend an opportunity for further engagement. That seems a thin reed. Fundamentally, the negative trend is only confirmed by the last few quarters - and, in fact, on the admissions front, the news is getting worse. ISCA does have some contributions coming from its ONE DAYTONA mixed-use development, which should boost FY20 EBITDA by $10 million, and a renovation at ISM Raceway in Phoenix, which should be an $8.5-$9 million lift this year. But the latter project is included in guidance - and return on capital in both projects combined is in the high-single-digits. Underlying profit growth here is pretty much zero, and with little help from tax rates or multi-year deleveraging (which has cut interest expense substantially), there's simply no reason to expect that to change over the next six years. As long as attendance keeps declining, the loss of those high-margin sales will offset the increases from similarly high-margin media rights revenues. So what's ISCA worth as a standalone? I still believe the downside is significant (with the caveat, again, that the market largely has ignored those arguments for a couple of years now). EBITDA should be ~$250 million. Capex is running at ~$100 million a year through FY21 (excluding ONE DAYTONA); it seems unlikely, though possible, that figure comes down with major projects of late only at three of the company's 12 Monster Energy Series tracks. Interest expense is down toward $10 million, and the tax rate is guided to 25-26% this year, with D&A in the $105M range. Normalized free cash flow, then, should be about $105 million. It's tough to see what the media rights landscape is going to look like in 2024 when NASCAR goes to renegotiate its deal. But the landscape ten years earlier was close to perfect, when NBC (part of Comcast (CMCSA)) and Fox (FOX) (FOXA) were looking to compete with Disney (DIS) unit ESPN. (How much times have changed in the last five years.) Those two networks drove up the bidding and created the media rights deal that is benefiting ISCA at the moment. Even assuming Facebook (FB) or Alphabet (GOOG) (GOOGL) or another tech titan joins the streaming space, it's difficult to see NASCAR replicating that deal. The audience by that point, based on recent trading, might well be half of what it was the decade before. This increasingly looks like a sport whose best days are behind it. And it's worth noting that ISCA's free cash flow margin is about 15% of revenue, while media rights revenue now is over half the total - at something like 54% after-tax margin. Assume the continued high-3% growth through 2025, and then a 20% stepdown in the rights deal, and ISCA is roughly back to 2019 media revenue levels - and almost certainly sees FCF decline. In that context, anything over 10x P/FCF seems too high - which values ISCA at about $25. 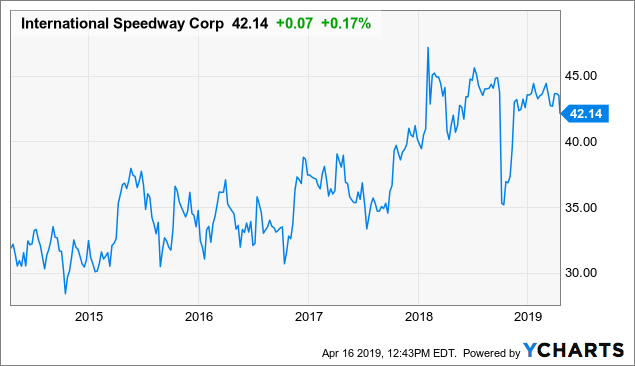 EV/EBITDA isn't much different: ISCA trades at over 7x, while Speedway Motorsports (TRK) is at 6x, a multiple that values ISCA at $34. Again, I've made similar cases before, but the recent quarters strengthen the argument. The acceleration in negative attendance trends in the second half wipes out any optimism about the new 'stage' format. The economy, by the way, is quite strong - which should be helping attendance. What happens if there's a recession in the summer of 2021? Where does attendance go to at that point? At the very least, after the last three quarters, it seems exceedingly unlikely that ISCA can hold $40 - or perhaps even close - on its own. Again, the market's resilience here has surprised me - but at a certain point, the narrative here has to change. This is a declining sport; and outside of the media deal, ISCA is a declining business. Obviously, an acquisition erases all those problems. The current price just above the $42 offer seems to suggest that investors are expecting a higher bid. It seems unlikely that investors still are giving the case here that much credit from a fundamental standpoint, because TRK shares have finally given way, and trade at a seven-year low. Logically, there's reason to see the deal going through. The France family already owns 40%+ of the stock. ISC's balance sheet has been cleaned up, which should allow the family to borrow against the business to fund some of the purchase. (The company actually has slightly positive net cash at this point.) It's hard to imagine the family made the offer public without some consideration as to whether it could be completed. With the recent results and the plunge in TRK, it seems unlikely minority shareholders would vote against, or fight against, a takeover. But the market seems to be pricing in some reasonable probability of a higher bid - presumably from the France family. That, too, seems logical: something like $45 might be a price where everyone gets a bit of what they want and can go home. That said, such a price hardly seems worth the risk at this point from the long side. The ISCA board isn't in a position to demand $50 - and the France family, even with their deep ties to the sport, would hardly seem willing (or maybe in the position) to pay it. Indeed, from here, $42 looks like a life preserver, not an opening salvo. Without that bid, it's exceedingly difficult to make the case that ISCA should be trading near the highs while TRK is at the lows. The two companies are simply too similar (though I'd argue ISCA has executed better in recent years) and the broader trends in their sport too negative. As such, betting on a higher bid looks like the proverbial case of picking up pennies in front of a steamroller. Investors might well get an extra buck or two a share if this works out. If it doesn't, however, ISCA has a long way to fall.